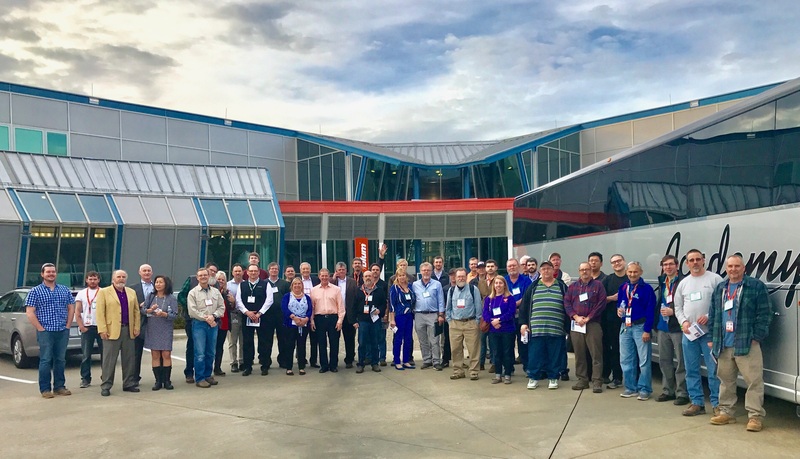 HOLLAND, MI – As our homes become increasingly multipurpose, consumers are looking for new ways to do more within the same space. With the introduction of its innovative new desk bed, ORG, a leading provider of custom organizing and storage solutions, is pioneering a new solution for the limited-space puzzle. This design addresses the growing desire for versatile solutions in multi-purpose rooms and smaller size areas,” said Randy Tallman, director of product and marketing at ORG. “A lack of square footage doesn’t mean a home has to have limited space efficiency. 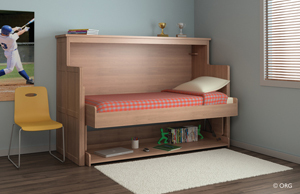 This new desk bed technology opens up a world of new possibilities for shared uses in a spare room, child’s bedroom, guestroom or even a college dorm,” said Tallman. According to the National Association of Home Builders, the average size of new homes has decreased. Over the next few years, home sizes are expected to shrink even more, fueling the need to maximize usable spaces and increasing the demand for smart storage options. The ORG desk bed represents a new generation of home design that responds to this trend by providing multiple functions without compromising on space or style. Within a floor space of just 82” by 44” for the twin size bed, the ORG desk bed meets two key needs efficiently. By day, its large open work surface provides ample space for homework, web surfing, or creativity. By night, the work area transforms into convenient sleeping quarters, which disappear just as easily in the morning. While the desk bed can stand alone, homeowners can also integrate it with other solutions from ORG’s comprehensive product line. Adding shelves, bookcases, and storage cabinets can transform underused space to an inviting room that boosts a home’s appeal and organizational efficiency. The design is offered in a wide range of styles and finishes providing deep color and beautifully-detailed wood grain texture. With solid construction, precise engineering, and uncompromising materials, the desk bed continues ORG’s tradition of manufacturing high-quality solutions for the organizational and aesthetic needs of today’s homeowners. The versatile ORG desk bed will be available through the nationwide network of authorized ORG dealers beginning in early March. Local ORG dealers provide professional design services and expert installation. They can help customers organize any area of their home or business including closets, kitchen pantries, garages, laundry rooms, offices, break rooms and more. Since 1987, ORG has provided quality solutions for any organization challenge. ORG personalized home storage products create efficiency, and can help customers bring order to their lives so they can find more time to enjoy what matters most to them. ORG offers a complete range of organization solutions including custom closet organizers, garage cabinets, pantry storage systems, wall beds, laundry storage, office organizers, entertainment centers, mudroom storage and more. ORG products are manufactured in Holland, MI by The Stow Company.